During //BUILD/2018 event, Microsoft announced a set of new features and capabilities for the Windows developers. Microsoft now releases an updated version of the Windows 10 SDK, which brings the new capabilities to Windows apps. The latest version of Windows 10 SDK comes as part of the latest version of Visual Studio 2017 (v15.9.1). Here's the key features included in this build. The latest version of Windows 10 SDK includes the updated Windows UI Library (WinUI), which allows you to take advantage of the latest Fluent controls and styles for Windows 10 apps. It allows developers to access the XAML controls and elements through NuGet packages. This means that apps can now use modern controls and Fluent Design elements in versions of Windows that didn't originally support them. The WinUI library was made available in developer preview back in the summer, but it's now out of the testing phase and generally available to developers. For apps that aren't built on the Universal Windows Platform (UWP), a new XAML Island is now available. This includes WinForms, Win32, C/C++ etc. and the UWP XAML hosting API (Preview) allows developers to use UI elements from UWP in apps built on older technologies to provide a more modern look without changing the underlying technology. The feature was announced back in April, during //BUILD/2018 event. This latest version of the Windows 10 SDK includes support for Adaptive Cards 1.1, which brings new features such as Media Element and Action Icons, as well as a new visual designer. Adaptive Cards is available in Outlook as Actionable Messages, in Cortana with Skills, and Teams through Azure Bot Service. A preview version of the Graph Notifications are now available, which offers an enterprise-compliant, people-centric and cross-platform notifications platform using the Microsoft Graph. The preview bits support iOS, Android, Windows and the Graph Explorer. The Project Ink Analysis allows you to write applications which will allow your users to draw and express themselves using the new capabilities to understand/recognize and make the ink more productive. Hyper-V now allows developers to run an Android emulator with all the latest APIs right inside Windows. It requires the Windows 10 April 2018 Update (version 1803) or later on an x86 based machine and Visual Studio 2017 version 15.8 or higher. It's now easier to start the Windows Machine Learning API, as it's same for both Win32 and UWP applications. It has new capabilities which includes support for ONNX v1.2.2 models, the ability to convert FP32 datatypes in ONNX models to use FP16, support for Windows Server 2019 and improved evaluation times on the CPU/GPU. 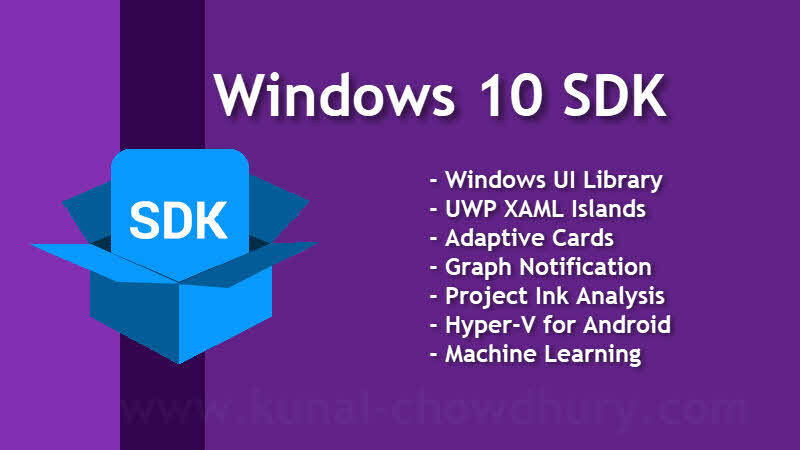 If you have come this far, it means that you liked what you are reading (Microsoft updates Windows 10 SDK with WinUI Library, XAML Islands, Hyper-V for Android, Machine Learning and more).